M. Florea is a new project from former Bonnie and the Beard frontwoman Megan Fong. She is joined by Alex Ferreira on drums, Wesley Watkins on horn, Eli Saragoussi on bass and Claudine Rousseau on guitar and keyboards. The shows begin at 6:30 p.m. in Eagle Town Park. Visit www.vvf.org to learn more. EAGLE — Eagle Town Park will once again transform into an ideal mountain music setting tonight when M. Florea comes to town for the second installment of the ShowDown Town free concert series. The music begins at Eagle Town Park at 6:30 p.m. along with children’s activities and food and beverage options. Concertgoers are welcome to bring their own coolers and folding chairs. New this year, Bonfire Brewing will offer on-site public beer sales. M. Florea is fairly new to the Colorado music scene; the Denver-based band is currently recording its debut EP. But the band’s members are no strangers to the spotlight. M. Florea is a new project from former Bonnie and the Beard frontwoman Megan Fong, who delivers soulful, deep-voiced music reminiscent of Amy Winehouse. She is joined by Alex Ferreira on drums, Wesley Watkins on horn, Eli Saragoussi on bass and Claudine Rousseau on guitar and keyboards. 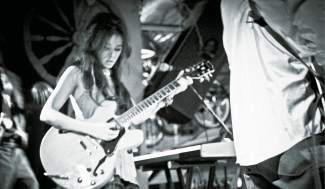 Fong’s newest project continues to highlight her songwriting talent for spinning tales of light and dark, lost and found. Her songs thread together blues, soul, gypsy and rock influences into a sound all her own, brought to full force with her band of talented musicians. Later this summer, M.Florea will play the Mixed Taste series curated by the Denver Museum of Contemporary Art, in addition to appearing at the 15th annual Denver Post Underground Music Showcase. Visit http://www.vvf.org to learn more about the ShowDown Town concert series.